Come April and my search for chocolate-y recipes begin. When two family birthdays are aligned a week apart, this tends to happen. No ? My mother and my husband.... both big time foodies.. in particular chocolate lovers, celebrate their birthdays in April... so come April my search for everything chocolate-y peaks and sometimes leads me to boxes of chocolates and sometimes to cookbooks full of chocolate-y treats.... like The Ultimate Brownie Book ..
Center the rack and preheat oven to 350°F. Grease a 8×8 inch square baking pan, using vegetable oil. Dust it with cocoa powder and keep aside. In a large bowl, beat the sugar and oil until they are well combined. Add 3 egg yolks all at once and beat until completely incorporated. Once the mixture is uniform, using a wooden spoon stir in the cocoa powder and then the almond flour. Now clean and dry the mixer beaters, then whip the egg whites at medium speed until frothy. Increasing the speed to high, beat the white for 3-4 minutes more until soft peaks begin to form. Using a rubber spatula or your hand( I found it easier to work with my hands), incorporate half of the beaten egg whites into the chocolate mixture. This will somewhat soften the mixture. Stir in the nutmeg, chocochips and chopped dates into the mixture. Finally using a wooden spoon or rubber spatula, gently fold in the remaining egg whites into the mixture and stir until all the ingredients are just incorporated. Gently spread the batter into the prepared pan, taking care not to break the air bubbles. Bake for 25-30 minutes until the cake is soft yet set. A toothpick inserted should come out with wet crumbs attached. Set the pan on a wire rack to cool for atleast 2 hours. 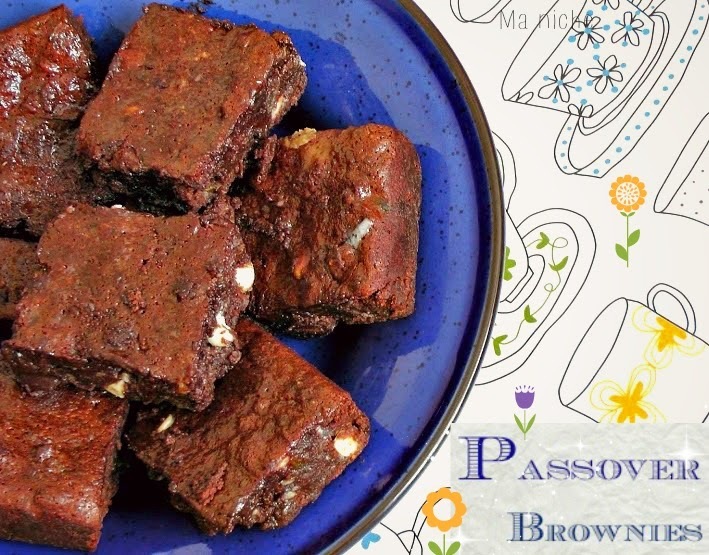 Preferably chill it in the pan overnight before cutting the brownies into 9 squares. Remove the brownie bars with an offset spatula and serve immediately, or cover with plastic wrap for storage at room temperature. How tasty! Perfect for the holidays! that definitely looks absolutely chocolaty!!! 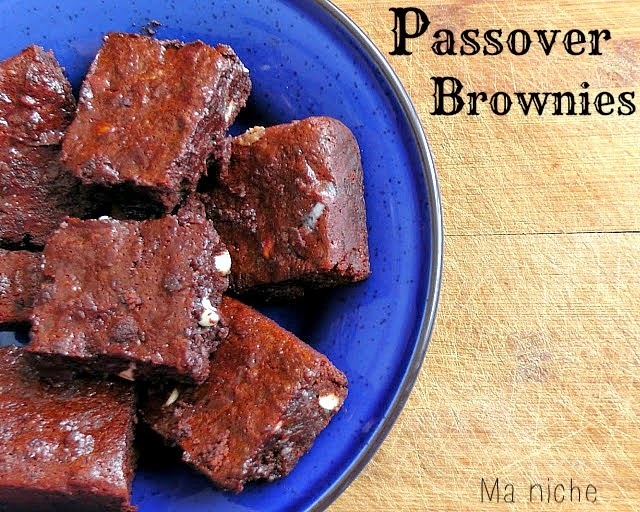 Passover brownies looks delicious Tanusree.